Regular cleaning of your sail is encouraged. Even the darker colour sails collect dust and dirt. Cleaning is a simply process of removing, taking away, pressure cleaning and re hanging the sail. Like everything around your house your shade sail needs cleaning and a bit of love every now and again. Depending on the position of the shade sail, once a year more often than not enough cleaning to keep your shade sail in tip top condition. You can do it yourself by removing and pressure cleaning, but a lot of sails have high points and can be difficult to get back up and looking the goods. 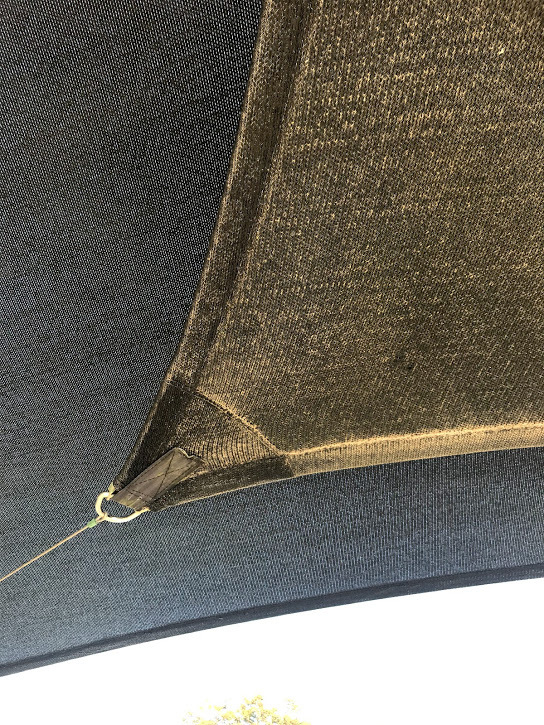 We can certainly help and to remove clean and retention the sail is not a huge expense and gives the sail a longer life. The picture on the right shows the difference of two sails, one has been pressure cleaned and the second hasn’t. Spot the difference. Contact us today for a quote to clean your sail. We are specialists in creating shade solutions for your home. With over 20 years in business and combined 35 years in the construction industry, we've got you covered.